In January of 897, one of the more bizarre events in the history of the Catholic Church occurred within the walls of the Basilica of St. John Lateran in Rome. There, Pope Stephen VI personally conducted a posthumous trial of Pope Formosus, who had died about nine months earlier, and the dead pontiff's corpse attended in person. Formosus was born around the year 816 in Rome and first enters written history in 864 when he was named Cardinal-Bishop of Porto (near Rome) by Pope Nicholas I. Over the next decade, Formosus served a prominent role under a succession of popes, spending time as a papal representative in both Bulgaria and France. The Bulgarians liked him so much, they petitioned to have him become their own archbishop, but this request was denied. In 875, when Holy Roman Emperor Louis II died without an heir, Formosus was sent by Pope John VIII to Charles the Bald, King of the Franks, to offer him the crown of the empire. Charles naturally agreed and was crowned on Christmas Day, 875. This proved, however, to be a controversial decision by Pope John, as a number of papal officials believed Charles' older brother, Louis the German, should have been given the crown of the Holy Roman Empire instead. Despite being one of those sent to summon Charles, Bishop Formosus was, evidently, one of these dissenting officials. It didn't help that Formosus had been a candidate for the papacy himself in 872 when John was elected, so John might have had good reason to view Formosus as a potential opponent. In any case, when the opponents of Pope John fled from Rome to escape his wrath, Formosus went with them. John immediately convened a synod - that is, a council of church officials - to demand the fugitive bishops return to Rome under threat of excommunication. For his part, Formosus was charged with conspiring to attain the Archbishopric of Bulgaria as well as conspiring to "destroy the Papal See," opposing the new emperor, and deserting his diocese. When he and the others failed to return, another synod pronounced them guilty and Formosus, who was sheltering in France, was formally excommunicated and stripped of his titles and positions. Undoubtedly to Formosus's great relief, John VIII died in 882 and was replaced by Marinus I, who immediately reversed all of John's decisions regarding Formosus and restored him as Cardinal-Bishop of Porto in 883. Such was the vacillating nature of the medieval papacy. Formosus flew under the radar for the next eight years under a succession of short-lived popes, until 891 when Formosus, himself, was elected to the papacy at the age of 75. He became the Bishop of Rome during a troubled time in European history. The empire established by Charlemagne almost a century earlier had collapsed under his great-grandson, Charles the Fat. Following his death in 888, the empire was split into five independent kingdoms. One of those kingdoms was Italy, and it eventually went to Guy of Spoleto, who was crowned by Formosus's predecessor, Pope Stephen V, in 889. Two years later, just before his death, Stephen crowned Guy as the next Holy Roman Emperor. Formosus did not share his predecessor's trust in Emperor Guy and viewed him as a threat to the papal lands in Italy. However, without a viable alternative, he was reluctantly forced to affirm Guy's claim to Italy and the empire in 892, also crowning Guy's son, Lambert II, as co-emperor. Despite these public actions, Formosus secretly sent an embassy to East Frankia (modern Germany) to beg Arnulf, King of East Frankia, to come and overthrow Guy and his powerful allies. Arnulf agreed and brought his armies to Italy in 894. There, he liberated northern Italy from Guy, who conveniently got sick a died a few months later, allowing Arnulf to proclaim himself the new Italian king. Guy's son, Lambert, already crowned co-emperor but still just a teenager, had no intention of allowing Arnulf to take his inheritance. As such, he traveled with his powerful mother, Empress Ageltrude, to Rome so that Formosus could confirm his inheritance as sole emperor and King of Italy. In a decision that would literally haunt him even beyond his own death, Formosus refused, openly declaring his intention to give the crown of the empire to Arnulf. 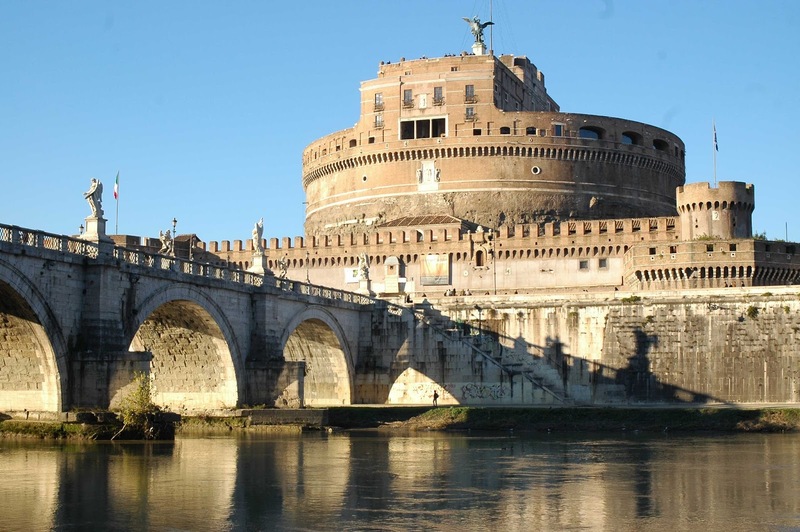 Lambert and his mother had Formosus imprisoned in the Castel Sant'Angelo for his efforts. In February of 896, Arnulf arrived at Rome, liberating the city and freeing Formosus. Empress Ageltrude fled to her son Lambert, who was by that time back in his stronghold of Spoleto. Formosus immediately crowned Arnulf as both king and emperor. Following this, Arnulf set off to finish Lambert and his mother once and for all, but collapsed from a stroke on his way to Spoleto and was never able to continue the fight. Several weeks later, in April of 896, Formosus, who was by this time about 80 years old, died of natural causes. With both Arnulf and Formosus suddenly out of the way, Lambert and his mother found themselves without significant opposition in Italy, and only in need of a pope who would support their cause. The succession of events following this are not entirely clear. Here are the facts: within just a few days of Formosus's death on April 4, a Roman priest who had twice been defrocked for "immorality" was elevated to the papacy on the demand of the Roman populace (at this point in time, public and political pressure, not to mention bribery and corruption, frequently influenced the election of popes). He became Boniface VI. He ruled only 15 days before dying. How he died is not clear, although sources record that he suffered from gout. Much speculation has suggested he was murdered by a faction of Romans who supported Lambert over Arnulf, in order to make way for a pope more sympathetic to Lambert's cause. Whatever the cause of Boniface's death, he was replaced by Stephen VI, who had been ordained as Bishop of Agnani by Formosus himself, but was no friend of the deceased pontiff. Although his motivation is anyone's guess, a few months after taking over the papacy, Stephen ordered Formosus's body to be disinterred and put on trial. The corpse was literally decked out in full papal vestments and propped up on a throne before the gathered council of church officials. Stephen presided over the trial himself, with a deacon of the church answering for the mute Formosus. According to a 10th century historian writing some 75 years after these events, Stephen asked the corpse of Formosus: "Why did you usurp the Catholic Roman See in such a spirit of ambition?" One has to wonder what the corpse's reply was. The charges against Formosus were similar to those brought against him two decades earlier by Pope John VIII. He was accused of perjury, ambition, coveting the papacy, performing clerical rites as a layman (presumably during his years of excommunication), and, perhaps most significantly, violating Church laws against the so-called "transmigration of bishops." This last charge needs some context. The First Council of Nicaea, which had established a series of Church laws in 385, had forbidden a bishop of one diocese from vacating that diocese and becoming bishop somewhere else. This is the ancient law that Nicholas I had used when denying the request for Formosus to become Archbishop of Bulgaria. More importantly, this law also applied to the Bishop of Rome - that is, the pope. If someone was already a bishop somewhere else, he could not become the pope. Marinus I, in the 880's, had been the first to break this rule, and he had been followed in this by not just Formosus, but also by Stephen VI himself. How could Stephen have condemned Formosus for doing something that he, himself, was guilty of? Wouldn't that also invalidate his own pontificate? This is where the speculation on motive comes into play. When, after three days, Formosus was found guilty of the charges brought against him, his papacy was declared invalid and everything he had done was declared null and void. This meant that Stephen's consecration as Bishop of Agnani, performed by Formosus, was no longer valid. Which, of course, meant that Stephen was no longer guilty, himself, of becoming Pope in violation of ancient Church laws on the transmigration of bishops. Many modern historians argue that this desire to legitimize his own papacy is what motivated Stephen to enact the spectacle of the Cadaver Synod. Others have chalked it up to the connivance of Lambert and his mother, seeking to punish and discredit Formosus in order to secure his own claims to Italy and the empire. After all, if Formosus's pontificate was invalidated, then Lambert's enemy, Arnulf, had no claim to either the kingship of Italy or the Holy Roman Empire. The weight of the evidence suggests Stephen was a shrewd manipulator who saw an opportunity to placate Lambert and his powerful allies while also legitimizing his own claim to the pontificate, which was undoubtedly on shaky ground. After finding Formosus guilty as charged, Stephen ordered the three fingers of his right hand, which he would have used for making blessings, to be cut off, and his body thrown in a commoner's grave. A few days later, a mob disinterred the much-abused body for a second time and tossed it into the Tiber River. A monk, however, apparently rescued the body and by the summer of 897 claims were being made that the corpse had performed miracles. 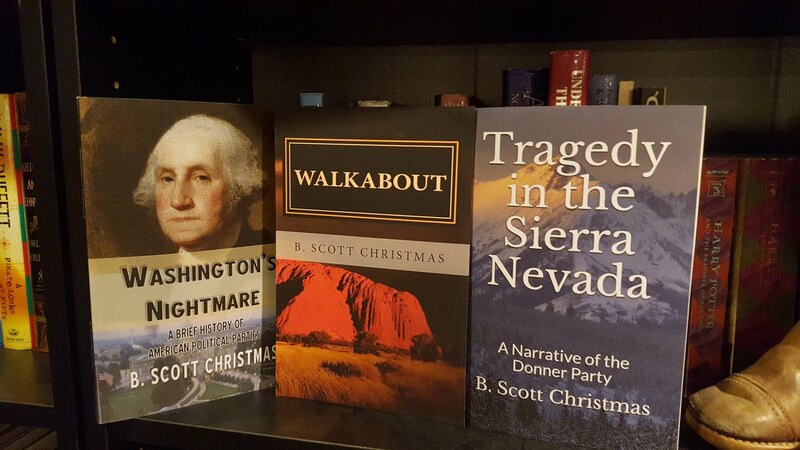 This, together with a sudden structural failure within the basilica where the trial had taken place, soon led to a major backlash against Stephen by the fickle Roman populace. A mob stormed the Vatican and deposed him, stripping him of his papal vestments and throwing him in prison. He was strangled there a short time later, in August of 897. After that, all hell broke lose. The pro-Formosan faction installed a new pope, named Romanus, into the Vatican. However, he was apparently not proactive enough in reversing Stephen's decisions against Formosus, so the mob deposed him several months later and confined him to a monastery, where he disappeared from history. In his place, they elected Theodore II. Theodore proved more responsive to the demands of the Roman public. He immediately annulled the rulings of the Cadaver Synod, rehabilitated all the acts of Formosus, and re-installed all the Formosus-era clergy who had been stripped of their clerical status under Stephen. Finally, he brought Formosus's body, which by now must have been in pieces, back to St. Peter's for an honorable reburial in his original tomb. Following this, Theodore promptly died, just twenty days after being elected. After his death, two competing popes were elected. One was Sergius, Bishop of Caere, an opponent of Formosus who had actually taken part in the Cadaver Synod. The other was John, who had the support not only of the Formosus faction, but also of Lambert. 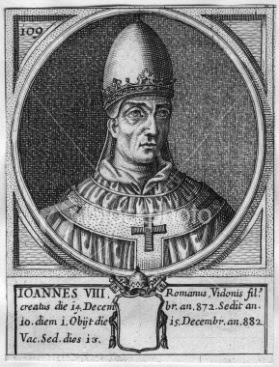 John's supporters eventually won the day, and he was installed as John IX in January of 898, the fourth pope in less than six months. He confirmed all of Theodore's decisions regarding Formosus and (sadly for historians) ordered the minutes from the Cadaver Synod burned. Sergius was not to be outdone, however. John IX died in 900 and his successor, another pro-Formosus pope named Benedict IV, died in 903. Benedict was followed by Leo V, a non-Roman who was likely a compromise candidate among an increasingly factional Formosan party. He ruled less than a month before being deposed by another Formosan candidate, this one from Rome, named Christopher, who is now regarded by the Catholic Church as an anti-pope (though he was considered a legitimate pope until well into the 20th century). Christopher, in turn, was overthrown a few months later by none other than Sergius, who apparently then ordered both Leo and Christopher to be murdered. Sergius became Pope Sergius III and ruled until 911. Opposed to Formosus and his supporters, he invalidated the rulings of Theodore II and John IX regarding Formosus and reconfirmed the initial rulings against him by the Cadaver Synod. He even went so far as to add an inscription to the tomb of Stephen VI congratulating him for his work and demonizing Formosus. 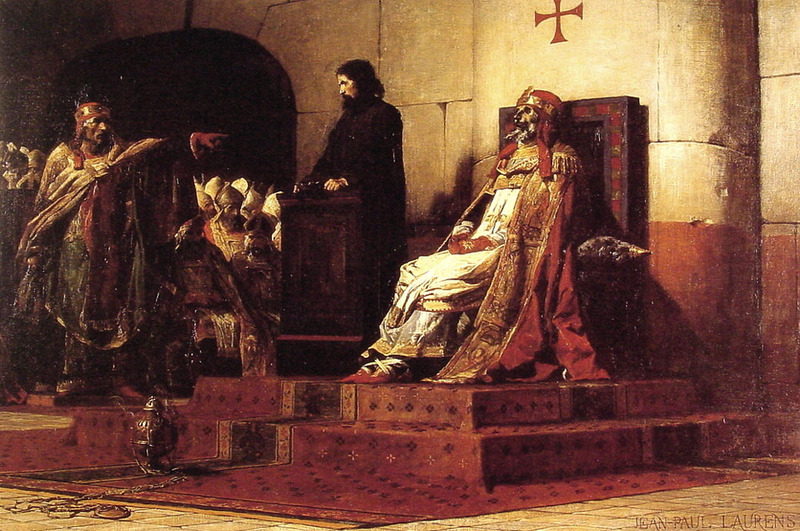 The rulings by Sergius proved to be the last official rulings in the case of the Cadaver Synod. By the time Sergius died, nearly fifteen years had passed since Formosus's death, and any more official rulings on his papacy must have seemed pointless by then. Regardless, the Cadaver Synod is regarded today, both by historians and Catholic theologians alike, as totally unlawful, and Formosus is considered by the modern Church to have been a legitimate pope whose only failing may have been personal ambition. It is worth noting, however, that there has never been a Formosus II, although one 15th century pope - Paul II - considered taking the name before being talked out of it. 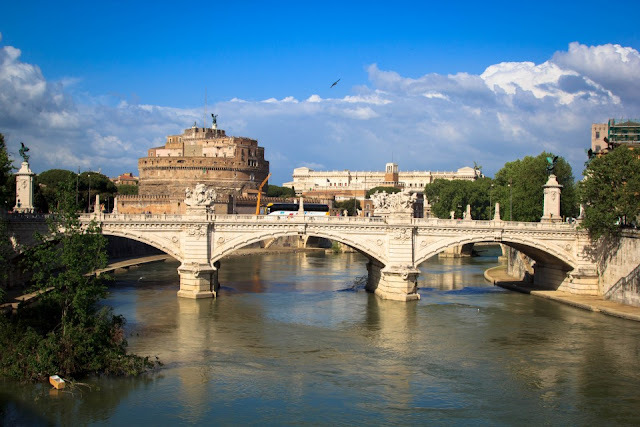 The tomb holding the desecrated bones of Pope Formosus, housed in St. Peter's Basilica, was destroyed in the 16th and 17th centuries when the original basilica was torn down and the present St. Peter's was constructed. Greag stuff as usual Scott!